Parody is one of the central elements of filk culture, but that's another post. What I want to talk about today are hilarious original songs about things like Star Wars and cruelty to coffee beans. I want to talk about The Faithful Sidekicks. 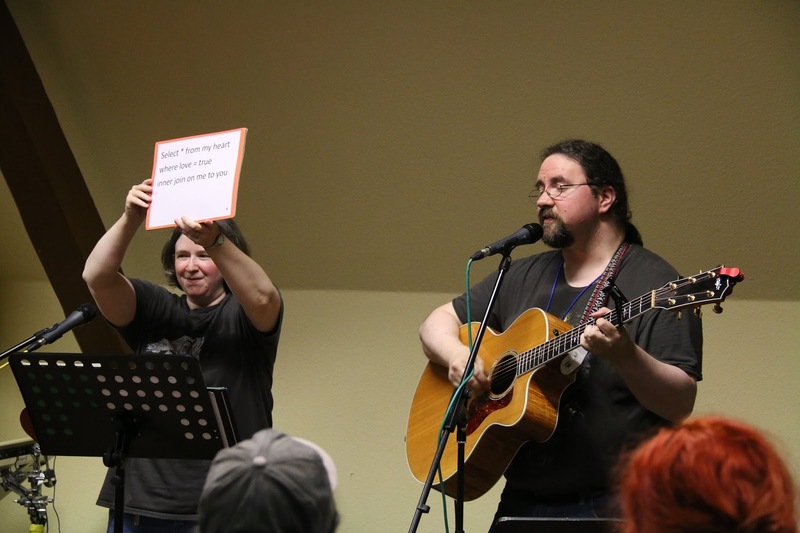 I had no idea who Eric Distad was in 2014, when he ascended the Ohio Valley Filk Festival (OVFF) stage during the annual songwriting competition and started to play his guitar. It seems like this is usually how I hear about up-and-coming cool people. The theme was "A Sticky Situation." Eric took this rather literally, to excellent effect. Below is a video of him performing "A Song of Stick Pins," which won first place in the contest. It speaks for itself. Incidentally, 2014 is the same year that Eric and his wife Jen began playing under the name of The Faithful Sidekicks. 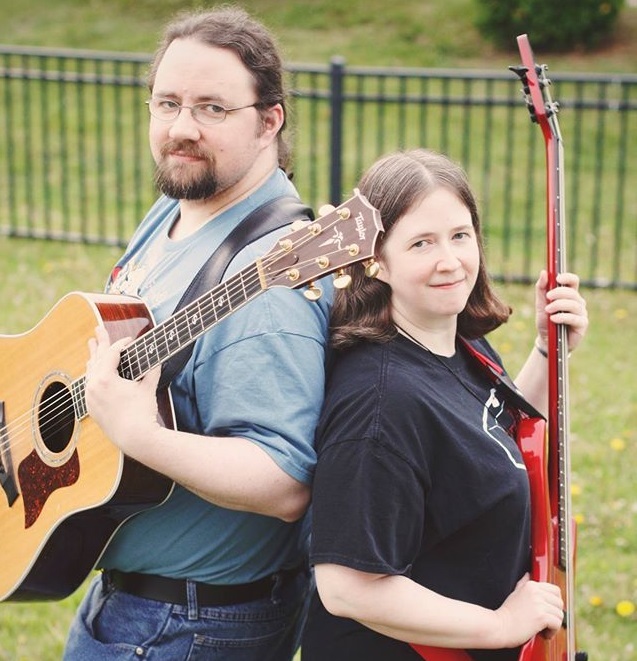 Eric and Jen had been writing and performing music together for much longer beforehand, but it wasn't until 2014 that they devoted an entire act to nerdy goodness. As The Faithful Sidekicks, they tend towards the wacky in styles ranging from alternative rock to folk ballads. You'll often see Jen contributing via bass guitar as Eric plays lead and does the primary vocals, but both of them are skilled with other instruments such as mandolin, concertina, and bouzouki. Whatever the vehicle for their music, it is always chock full of genuine geek humor. You know they take their nerdiness seriously (or entirely unseriously) when they come out with a love song written entirely in Structured Query Language. Eric and Jen have a special routine for this one. As you can see, the references get very specific, folks. I will love them forever simply for writing a dance number entirely about the mysterious technology featured in the movie Galaxy Quest, a device known as the Omega 13. It is rather catchy, if I do say so myself. Other notable examples of such specificity include "We’re Dragons (an Open Letter to Cressida Cowell from Smaug)," which lambasts the cuteness of How to Train Your Dragon, or "Time Traveler," which basically exists in order to reference as many sci-fi books and TV shows as possible. For the uninitiated, they do have a good number of more general songs, such as the IT guy's oddly upbeat lament entitled "Ticket Open." Finally, let's come back to Star Wars. It seems to be a favorite subject, given the number of songs they have written about the franchise. Here they are at FilkOntario 2016 playing the song they are probably best-known for, "Han Solo for President." Like this combination of musical variety, wit, and delightfully detailed shout-outs? The Faithful Sidekicks currently have an album available for purchase here, and are wrapping up work on their second album, most likely called "Achievement Unlocked." To listen to all of the songs mentioned in this post, or to find more audio and video, news about the band, and information on their live shows, you can go to their website. If you're local to the Columbus, OH area, they will be hosting a workshop on songwriting to a deadline at OVFF this year. Come and meet them in person! If you can't make it, at least be sure to check out the rest of their repertoire. You won't regret it. deserves a filk song? Let us know in the comments! I really like the Featured Filkers series, but I have a quibble with the description that the verb "to filk" is synonymous with writing a ridiculous parody. To me and many others to filk a song is simply re-using a tune, whether the new work is serious, silly, or parodical.